The Miya-Miya combo presents us with this opening phrase because today, on their 53rd show as We are Juice=Juice, Yuka has just noticed that the script has their colors on it! It made her feel like she was seeing something rare so it made her happy to see it for the first time. Karin has very little to add to the opening statement, so Yuka moves on to ask if Karin has any clothing staples for fall. Karin explains that she doesn’t so much rely on staples but simply picks out the things that she likes at the time, and recently she has been interested in red check shirts. She bought some but has had tremendous difficulty trying to match them with things, which Yuka completely understands, though she thinks it would suit her (by the way, if you’re getting deja vu at this point, there’s a reason). Yuka recommends trying a cardigan, but Karin is stuck on what color of the check to try and match with. Yuka has been into long black skirts because they’re more mature and cover up plenty of things she might want to hide, so she bought one and actually wore it to the recording today. Karin admits that she has been interested in them but didn’t think she could pull it off when she tried one on, but it really suits Yuka and she looks very mature and stylish. The first letter comes from aMa no Jaku, who congratulates them on their new song release and says that they saw them perform as the opening act for Morning Musume at Budokan. Their performance made them feel like the 5 of them are going to move to bigger and bigger stages in the next year and hope to see them perform at Budokan soon. 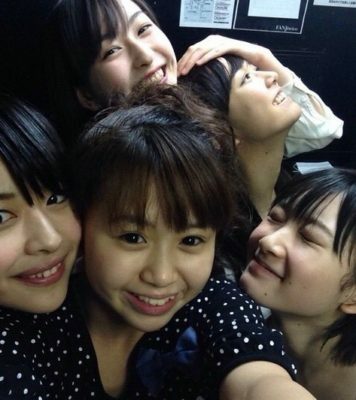 They think it would be amazing to do one big juice toast with all of the Juice=Juice family in Budokan. Another letter comes from Watada, who has been listening to their new songs since they got the CD and has been in love with Date ja nai yo since seeing them look so good performing it live in concert. This makes the two of them happy, especially the part about doing a toast in Budokan, which Yuka had thought of doing before. Karin makes a pun out of Budokan and says that they should all have grape (“budou”) juice. You didn’t hear that from her, though. Karin brings us this opening word as she has come to the conclusion that she loves lumpy foods. She loves strawberries, as most everyone knows, and they’re sort of lumpy and pulpy but she finds that it isn’t just the taste she enjoys but the texture. Uemu asks if this goes for other things as well, like salmon roe, and Karin affirms that most of her favorite foods are on the lumpy side. She also prefers to have her drinks be thicker and pulpy, which Uemu says she also enjoys. Karin adds that she has noticed Uemu also shares this affinity for pulpy, lumpy things, since they both enjoy kiwi seeds and such in their juice whenever they get it, but she also remembers something that happened recently with Uemu and food. The Juice=Juice members all went out to eat and they asked Uemu if she wanted anything in particular and she said, “takenoko,” or bamboo shoots. However, when the plate got to their table, Uemu started freaking out and asked why these perfectly normal bamboo shoots were so wrong. It turns out she had meant to order “kazunoko,” or herring roe, instead. Uemu retorts. “But they look the same! They have the noko in common you know so it’s easy to confuse them!” Uemu said what surprised her was that there had been a picture of the kazunoko that she was ordering from and they came out looking so different. Karin continues in the food discussion and asks if Uemu has any fall foods she’s looking forward to eating. 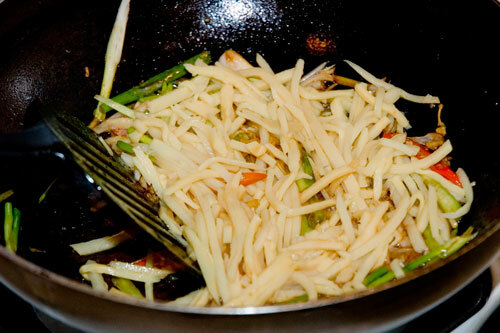 She says that roasted sweet potato tops her list, although she enjoys miso soup this time of year as well. Karin enjoys sweet potato as well, although lately whenever she really wants one she cooks it in the microwave to get it quicker. She discovered this when she wanted one but there wasn’t anyone around selling them. She and Uemu both delve into their best sweet potato salesperson impressions as a result. Uemu opens the show with this line because she thinks it would feel nice to make things for other people and have them think it’s delicious. Karin asks her if there are any recipes she’d like to try making, and Uemu says that she would like to try making chocolate cake. Karin changes the subject to the advent of fall and asks if Uemu has any clothing item that she pays particular attention to around this time of year when it starts getting colder. Uemu focuses on shoes because any outfit can become more fashionable with the right shoes. Karin says she has recently bought some fall clothing, but she thinks it’s really difficult to find things that match with red checked shirts or stripes these days but she’s going to try wearing them this fall for everyone. Uemu thinks that the clothes sound cute and really wants to see Karin in them. The first letter is from Meichan. She writes to say that she loves Date ja nai yo, uchi no jinsei wa, because there are some lyrics that say, “Don’t look so sad,” and when she had to go to the hospital recently, she heard the song and it put her in a better mood. She thinks that Juice=Juice have power in their music and thanks them for making it. She hopes to go to an event soon in the future when she’s feeling better. Uemu and Karin hope that she gets better soon so that they can see her in person and sing the song for her, but for now they’ll play the song on the radio. To celebrate their 50th radio show and their 1 year anniversary, Juice=Juice toast each other and also there is cake. The announcement about cake leads to a lot of yelling and screaming from Sayubee, in particular, while Uemu only wants to know if she’s allowed to eat it now. Kanatomo then asks everyone what they are drinking. Yuka’s voice is still in pretty bad shape so she’s drinking a healthier option, something called ACC juice, comprised of carrots, cabbage, and honey. The other members remark on how it certainly looks healthy and is a deep red color. Kanatomo breaks Juice=Juice code with her beverage choice, apparently. Kanatomo: Mine is… royal milk tea. Kanatomo: I mean there’s fresh apple juice and such, but I wanted to drink milk tea, so I did. Sayubee: Hm. Well I chose pure grapefruit juice, 100%, because I am the purest of all Juice=Juice. Uemu: What is that supposed to mean? Karin has a milkshake comprised of milk, eggs, and vanilla. Uemu has cocoa. Kanatomo says that Uemu has already finished more than half of her drink and looks very happy with it. 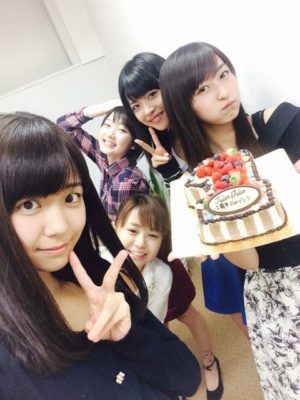 They decide to start digging into the cake and Karin mentions that Uemu should get cake first, which causes much delight and encouragement from Uemu who then proceeds to eat a massive bite of it while the others are admiring it. I should mention that you can hear straw-slurping sounds in the background, most of which I assume are from her. When they return from the song, Kanatomo comments on the straw sounds getting picked up by the mic and hopes that the listeners enjoy hearing them so that they can imagine Juice=Juice eating cake and having juice more vividly. So in the quietest intro the show has ever had, we learn that Yuka is on the brink of losing her voice (which leads to the most pitiful “yay” I have ever heard sprinkled throughout the show) and so we wouldn’t be able to hear her with any other noise happening. She assures us that she feels fine, just can’t really talk. Kanatomo then reveals that because they are celebrating their 1st anniversary of their major debut, they will be having a special radio show this time with all five members. Kanatomo introduces the first song, saying that out of the two songs in their next single, Senobi is much more of the typical Juice=Juice fare. It’s another in a long line of mature songs and has some lyrics about painful love and growing up, so she think it represents Juice=Juice very well. Sayubee says that at recent performances of the song, the audience members have sung the “woah woah woah” sections for them and it makes her very happy to have the fans involved with the song. The opening phrase is new songs, because Juice=Juice are releasing a new single on October 1! The new songs are entitled Senobi and Date ja nai yo, Uchi no Jinsei wa. Hooray! Karin: I could see her glaring behind me. Sayubee: I didn’t know what to do. If you make a mistake you make a mistake, but then it was just going to turn into more mistakes no matter what I did! I was sweating it out. Uemu: I just watched from the back. Every We are Juice=Juice begins and ends with a word. The opening word this time is color chalk, because all of the members of Juice=Juice have gotten some color chalk. It’s used to add very bright but very temporary color to hair, so the members each got their own fruit color to use. Sayubee got red and white in addition to yellow. They want to go out sometime with all of their colors in. This letter comes from Iwate Apple Cheeks. They recently entered the raffle for a Juice=Juice signed poster and won! They were really excited when they heard, but after waiting so long for it to arrive they were a little bummed. Then, when they opened it, they realized that they had completely forgotten it was signed. They’re going to get it framed and can’t wait to put it up on the wall because they feel happy just looking at how cute everyone is. They look forward to seeing Juice=Juice in person. The members congratulate them on winning and thank them for listening to their radio show through Radico’s radio streaming service. 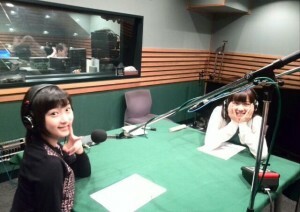 Karin also reminds us that Juice=Juice will be performing in Iwate on their News=News tour in Morioka. Karin asks Sayubee to tell the listeners what to pay attention to in Black Butterfly, since they’ve been performing it at Hello!Cons and on their individual tour. Sayubee says that everyone is wearing matching costumes for this song, all in black and with butterflies, which she personally likes, and that the dance is rather sensual and has various parts that she wants everyone to try doing along to the song, as well.